Our factories are fully equipped with surface treatment & paining facilities. We have built integrated production system which is from pipe production, surface treatment, painting, and efficiency of transportation. We response not only turnkey contract from pipe production, surface treatment and painting, but also each needs and visiting service. We take care of matters as they come. By integrated production system, We do short deadline, simplify procedures, low logistic cost. We produce mainly 15A-400A pipes which are handled at shipyard. In these year, we also response needs for plant&engine and expand our business area to diversified small-quantity production. Create added value from rust-preventative treatment, passivate film and improvement durability&mechinability by removal pollutant, impurities. Acid cleaning is our main technology and know-how intensive area about surface treatment. In recent year, cleaning line longest which is biggest line on west japan 12m has been completed. Various treatment such as 'Degreasing' removing oil, varnish, paint, 'Acid cleaning' removing rust, mill scale, gilding. We treat a diversity of rest-preventative treatments such as 'Phosphate film treatment', 'Alkali rust-preventation treatment' which is excellent for rust-preventation, 'Zinc phosphate film treatment' which is excellent for pain-adhesion, 'Manganese phosphate film treatment' which is good for mechanical sliding. We treat passivation treatment on various sized pipes by chemical precipitation, chemical paste adsorption method to remove oxide inclusion scale, oil and impurities etc. We response mainly chemical polishing by special chemistry, beside electrolytic polishing, buffing grouts. We do electroplating of zinc, nickel, copper, tin, chrome, gold, silver and nickel-electro less plating. Regarding cleaning a precision instrument requiring high know-how, we clean by ultrasonic cleaner or cleaning in clean room. We suggest foundation treatment according to the material of pipes or structure which is used at vessel and plant. Those material can be improved fine exterior and durability by painting what we do on customer's demand of spec. Response to needs of our customer is our moto of R&D. Our R&D suggest latest technology based on their own comprehensive result of quality test, experiment, analysis, produce about the subject what our production spot face the difficult task of with specialized equipment in our lab on 3th floor of our head office. Regarding development order, we decide optimum new development, improvement, produce based on beaker experiment. Then we make final proposal after we repeat pilot production in our factory and evaluation. In these later years, we cooperate with national research institute or collaborate with R&D team of other makers. 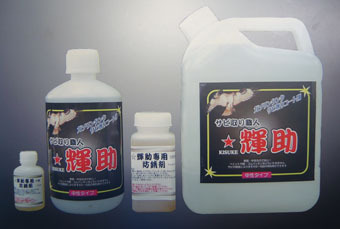 It can be used to remove rust or anti-rust in a fuel tank of motorcycle.